The film adaptation The Sound of Music was released March 2, 1965, and for many households, was the introduction to the von Trapp Family, and beloved classic songs such as “Do-Re-Mi”, “Climb Ev’ry Mountain” and “Sixteen Going on Seventeen”. However, while The Sound of Music was based on Maria von Trapp’s book The Story of the Trapp Family Singers (published 1949), there were a number of key differences between the true story of the von Trapp family, and that of the film and Broadway (first performed 1959) adaptations. THE VON TRAPP FAMILY DID NOT CROSS THE ALPS TO ESCAPE THE NAZIS. During the climactic scene of the show, the von Trapp family will flee Salzburg, Austria by hiking over the surrounding mountains. In real life, however, this would have lead the von Trapps into Nazi Germany, the very regime they were trying to escape! The real-life departure of the von Trapps was far less dramatic—in broad daylight, the family left their villa and crossed the railway tracks behind their home in order to board a train to Italy, under the guise of a family vacation. They did, however, leave just in time, as the next day the Austrian borders were sealed. Nazi leader Heinrich Himmler used the von Trapp’s villa during World War II as a summer residence once the von Trapp family had fled. THE REAL-LIFE MARIA WAS A TUTOR TO ONE OF THE CHILDREN, NOT A GOVERNESS TO THEM ALL. 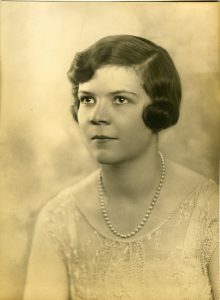 Georg von Trapp’s second-oldest daughter, Maria, contracted scarlet fever in 1926, and could no longer make the journey to school. Georg sought out Salzburg’s Nonnbery Abbey to find a tutor for his sick daughter. At this time, Maria Augusta Kutschera had entered the Abbey two years previous as a novice, and was the perfect candidate given her training at Vienna’s State Teachers College for Progressive Education. Her time with the von Trapps was to be a 10-month assignment before she formally entered the convent. MARIA AND GEORG MARRIED LONG BEFORE FLEEING AUSTRIA. AND SHE DID NOT LOVE HIM—AT THE TIME. 47-year old Georg von Trapp and 22-year-old Maria Augusta Kutschera were married on November 26, 1927, more than a decade before they fled. Maria claimed she fell in love with the children at first sight, and she liked their father, but did not love him. Though, as the years went by, Maria did learn to love Georg von Trapp. THE NAMES OF THE VON TRAPP CHILDREN WERE CHANGED IN BOTH THE BROADWAY AND FILM ADAPTATIONS OF THE STORY OF THE TRAPP FAMILY SINGERS. Overall, there were 10 von Trapp children, not 7. The names, ages and sexes of the children were all changed. 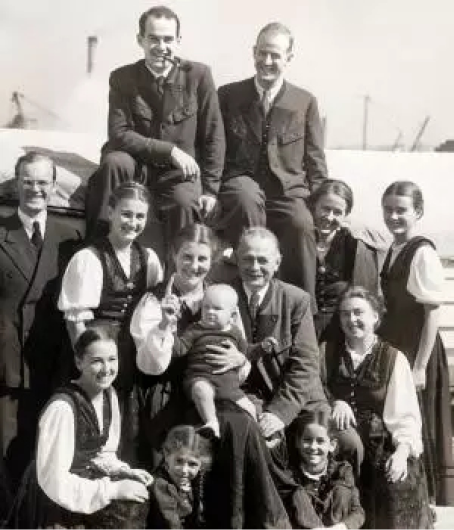 The oldest von Trapp child in real life was Rupert von Trapp, born in 1911 and a practicing physician by the time the von Trapps fled Austria in 1938. While the von Trapps were offered many enticements by the Nazis—greater fame as a singing group, a position as a medical doctor for Rupert, a further naval career for Georg. The von Trapps knew they were on thin ice—they refused to fly a Nazi flag above their home, refused to sing at Hitler’s birthday party, and Georg declined a naval command. After weighing the benefits against leaving behind their family, friends, estate and all of their possessions, they decided they could not compromise their principles and integrity, and they left. THE VON TRAPP FAMILY WAS NOT HAPPY WITH THE PORTRAYAL OF THEIR PATRIARCH. The captain was a warmer father figure than he was made out to be. While he did carry a whistle, and did have a distinct whistle sound for each of his children, as well as dressed his children in sailor suits, he did not have them marching or standing at attention. Out of the two parents, Maria was the one with a cooler demeanor. Though she was a caring and loving person, the real-life Maria was also prone to fits of temper. MARIA DID NOT BRING MUSIC TO THE VON TRAPP HOUSEHOLD. The captain and his first wife (who died of scarlet fever) enjoyed music, introducing it to their children and household long before Maria came from the Abbey. Before Maria came, the von Trapp children already knew how to sing and played a number of instruments. What Maria did teach them was madrigals. WHY DID THEY BEGIN PERFORMING? What originally lead the von Trapp family to begin singing professionally was, like many families, the loss of their fortune in the Great Depression. The von Trapps actually took in boarders in order to bring in additional funds. One of these boarders was Father Franz Wasner, who would act as their musical director for over 20 years. The fictional Max Detweiler never existed in real-life. After fleeing Austria with the von Trapps, Wasner accompanied them on their tours of Europe and the United States. Originally from Great Britain, M. Morgan Warren now lives and maintains a working Studio at Canoe Cove Marina, North Saanich, B.C. Through her highly detailed, realistic watercolours of birds and animals, she strives to give viewers of her work a special glimpse into the hidden lives of her subjects. During the past thirty-two years she has made an in-depth study of the fauna and flora of this region, recording her observations in hundreds of photographs, studies, and notes. 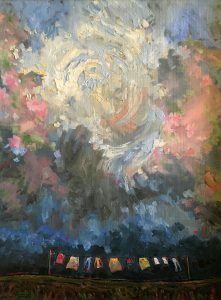 Morgan’s paintings and reproductions can be found in many private collections all over the world, including those of Her Majesty, Queen Elizabeth II, and HRH Prince Philip, Duke of Edinburgh. In 1996 she was the special guest of the DeYoung Museum of Fine Arts in San Francisco, where she demonstrated the techniques of John James Audubon for visitors to the national Audubon Birds of America Exhibition. Save the Children Fund Christmas cards, the international Sierra Club Foundation Annual Report, and Ducks Unlimited, among others, have featured her work. Rogers Chocolates recently chose six of her images to be included in their special Canadian Art Collection. As well as Morgan’s own Studio, her work can currently be found in a number of locations, including Victoria’s Murchies Tea and Coffee, and the world-famous Butchart Gardens. “Nature on the Threshold” is Morgan’s second book. 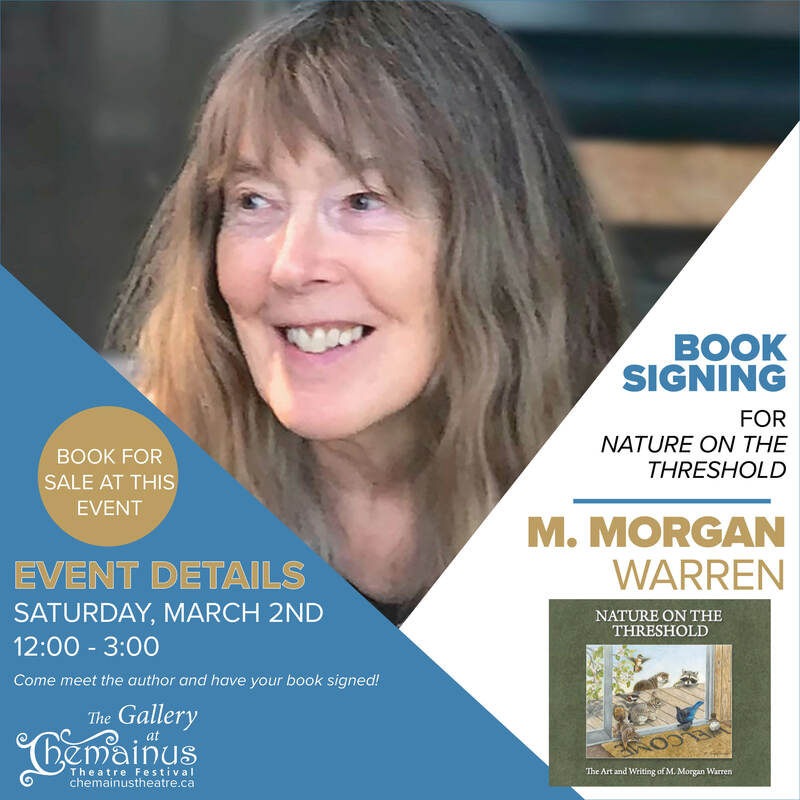 A published poet with a degree in English Literature and Creative Writing and one successful book, “Through Their Eyes and Mine”, already to her credit, Morgan has eloquently portrayed in words and watercolours the creatures and plants of the area where she lives. It is her wish that this book will enhance an awareness and appreciation of the beauties of our imperilled Natural World. When were you first introduced to The Sound of Music? I don’t recall the first time I saw The Sound of Music as a child, but I do remember being fascinated immediately by the costumes, the story, and especially by the music. Growing up I had a childhood friend who adored the film and called it ‘Maria’ instead of The Sound of Music, so in my mind since then I’ve always fondly thought of it as ‘Maria’. 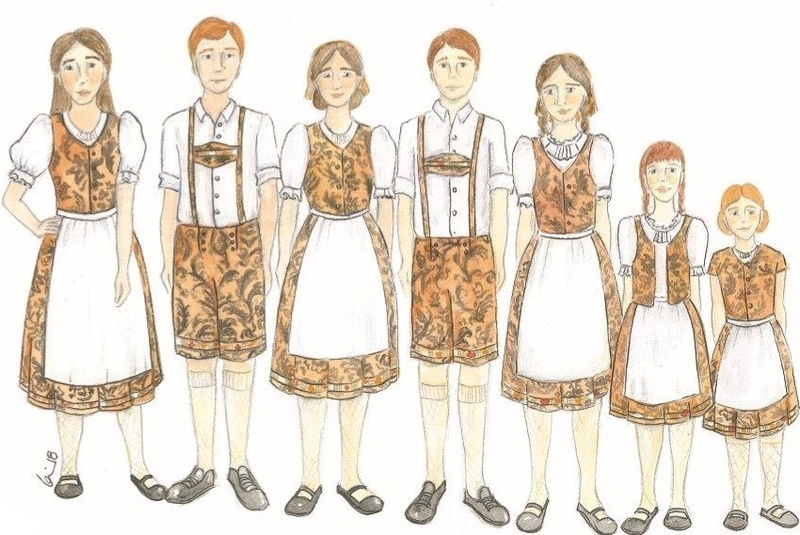 What drew you to want to design the costumes for The Sound of Music? There’s something so nostalgic about working on a show that you’ve grown up with and always admired. For me I think I have a list of about 25 films or shows that inspired me to enter such a creative career and The Sound of Music was definitely one of them. Because of that, it always holds a special place in your heart and to work on a show like that as a professional is so special, every design reminds you of that magical feeling you had when you were younger watching and experiencing the show for the first time. The Sound of Music is a very widely known classic – was it challenging to come up with your own costume designs? Certainly it’s always a challenge to design costumes for a show that’s so popular and well-known. There’s an expectation from fans of the show to see some of the iconic favourites from the film – costumes like the dress that Maria wears in the opening sequence of the film in The Hills are Alive is so iconic that doing anything other than her dress and smock look feels intuitively wrong for that moment. In the case of a classic like The Sound of Music I think it’s about finding a balance between bringing your own fresh perspective to the film while paying tribute and honouring some of the favourite designs established by Dorthy Jeakins in the 1965 film. My design process always begins with the script and with conversations with the Director, who has the overall vision and approach to the show in mind. Based on the script and those initial conversations, I begin to brainstorm and develop a concept for the costumes that will work within the overall vision that Director has. The first step to developing that concept is to dive into a great deal of research, both historical and visual – by that I mean that I’m looking for images and information regarding the exact country and time period that the show takes place in, while also looking for images, colours, textures and fabrics that inspire me and provide me with a ‘feeling’ of the show. Instinctively I like to think about the overall feeling of the costumes first, before diving into each character and their personality. Once I have some ideas in mind, there are more conversations and discussions with the Director, as well as some interactions with the Set Designer in order to see the world that they’re creating as that’s the same world my designs need to live in. From there it’s time to delve into character-specific studies and ask myself and other members of the creative team detailed questions about the characters and where they fit in this world and how that can be expressed through their costumes. From there I create collages for each character or look with my research and any colours or images that evoke the feeling I’m going for. These are the preliminary designs, which then go to the Director and the Head of Wardrobe for review and discussion. Once approved, we work together to suss out any details or specific challenges or costume needs, such as how long an actor has to actually get changed between scenes or if a particular actor needs some additional make-up to change their age to match their characters, then I begin sketching the final renderings. The renderings can take anywhere from 2 to 8 hours each to complete, so it’s a lengthy process to render costumes for such a large show, but it’s an important part of the process as this is when I develop the details for each character, and it gives me the ability to see all the costumes together on paper before they become a reality. Once the renderings are done, they go back to the Theatre for review and when they’re approved we move forward into realizing the costumes that will then appear on stage. What research goes into designing costumes? For a show like The Sound of Music, there’s several layers to the research because you’re telling a period-specific story that’s based on both real characters as well as a real event in time, the Anschluss. Not only that, but I think it would be impossible to ignore the 1965 film and first production of the musical, which means looking at the costumes and world created through the goggles of the creators in the 1960s. I find these types of projects to be the most interesting because each of these layers adds something to the costumes and to the overall feeling of the “world” we’re creating as a creative team. Is it easier or harder to design costumes for a different era? I think from my perspective it’s actually a similar level of difficulty – the challenge with designing costumes for another era is that you weren’t necessarily there to witness it firsthand, so you’re basing all of your work off of your interpretation of historical research and your knowledge of that time period. Depending on the period, it might also be that some of your audience members have lived in that period, so you have to be very specific and knowledgeable about what you’re putting on stage. On the other hand, I find designing modern costumes equally challenging because everyone in the audience knows what costumes should look like in a modern show, they’re living in that time period, it’s so easy to separate the audience from the characters if you’re not accurate. If you see a modern show in 2018 and someone is wearing a hat that’s from the 1980s (and not currently in fashion), audience members will likely see that error and it can distract or separate them from relating to the story. The Sound of Music has a large cast – do you find it difficult to create different costumes and styles for all of the different character personalities? Absolutely, the show contains over 90 costumes for 26 characters so it’s a large amount to design, create, and manage. One thing that always helps me is to remember that although each character is unique and has their own personality, they still have to fit in the world that we’re creating and by setting the rules of that world, it helps to narrow down the looks of the show and the ways in which we express each character’s personality. It’s also good to remember that not every personality is expressed overtly through their costumes, sometimes costumes play only a minor supporting role to the physicality, movement and voice that an actor or actress gives to their character and if the costumes are over-designed, it can take away from their performance or ability to perform. Which character was your favourite to design for? I think the children have been my favourite characters to design for, despite the fact that their looks are some of the most iconic of the show and have less room for flexibility/creativity. What I love about them though is that you can truly show the transformation of the children throughout the show, from their strict grey-blue sailor uniforms at the top of the show, to the exuberant and fun curtain-made play clothes and then their more individualized looks as they blossom for the concert performance under Maria’s care and love. By the end of the show I think that the children have this overall unified family look, but each costume has individualized details and we see a rainbow of colours and personalities expressed within their wardrobe. Is there any particular feature of your designs that you want the audience to know about? One of the simplest yet most effective elements to my designs is the colour story I create with the characters. Each character undergoes some sort of transformation in the show, told partially through the use of colour. An example would be Maria, who starts out generic in her black postulant costume, where she’s living limited by the rules of the Abbey, but once she goes to the Von Trapp family home, we see her in the colours of the natural environment that she loves, the Alps. I tried to bring in lots of golden yellows, warm whites, rich grassy greens and sky blues. In a similar way, the Von Trapp’s wear greys and dull blues, the costumes are uniform and lifeless. Once Maria arrives, I wanted to spread her warmth and natural colours to the children and Captain Von Trapp, which you’ll see in their slow but steady transformation to their end look. Other colours you’ll notice play prominently are the stark red, white, and black of the Nazi flag, which creates a strong and intentional contrast and sense of oppression against Maria and the children. What’s the biggest challenge about designing costumes for this show? I think the biggest challenge for a show like The Sound of Music is finding the balance between meeting high audience expectations while bringing something new and interesting to the table. No one wants to see The Sound of Music and not recognize their favourite characters and moments, for most people seeing The Sound of Music will be nostalgic and reminiscent of their childhood or the time that they first saw The Sound of Music and I want to honour that feeling. I would have to say that my favourite costume in the show is the wedding dress for Maria. When I began my research, I was positive that the dress worn by Julie Andrews in the film was completely wrong for the time period, the tiny waist and full skirt came off as very 1950s, however, once I delved in deeper I found that it was actually very similar to a lot of dresses I saw in my research of the time period. In the end, the design I’ve come up with is intended to have less fullness in the skirt and a slightly softer fabric to lean more towards the looks of the 1930s, but I’ve opted to keep a lot of the features from the film, like the higher neckline and simple fabric with no lace or frills. I’ve recently been shopping for my own wedding dress so I had a special place in my heart for designing Maria’s. How are your costume designs bringing something new to this show? I think that every time we design a show, we put on these goggles that contain all of our life experiences, where we come from, who we knew, all of our history and the way we view the world and that it’s impossible not to put our own touch on what we design because we’re viewing the show through these goggles. Despite sticking to so much of the historically accurate and original looks of the show, I know that each costume has my stamp on it, whether it’s the style of trim on the concert skirts that I picked based on memories I have of being in Austria and Germany a few years ago, or the fabric that Maria twirls through the hills in during the first scene, selected because it reminds me of a dress I had when I was younger, I think those details and subtle choices are the way that I bring something new and unique to the show, even when the overall looks are so iconic and recognizable. To me, this story has a beautiful kaleidoscopic effect. When you meet these characters at a different time in your life, the images shift; relationships and moments that slipped by you previously come into focus in brilliant, moving detail. The words are the same, but you are different; therefore the story is, too. For those of us who worked on the 2005 production, we’ve all experienced this. We’ve seen and felt new things, shaped by how we’ve grown – who we’ve become – since we last visited the world of Jo and her family. It’s wondrous and exciting, to realize how our perspective shifts, how capable are brains and hearts are, of growing, increasing, transforming. 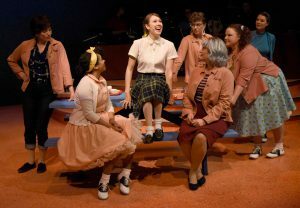 Given this, the show has something for everyone, even for those who’ve seen it before – and it’s great for families, for mixes of generations, because there’s something for all stages of life. For children who are so rich in imagination, always ready to play and make-believe; for young adults new to love, marriage and all its complications; for those of us who are caretakers, grappling with the inevitable loss of loved ones; for parents (and grandparents!) who recognize, and share, the gifts of hard-earned wisdom. version of ourselves. It’s a time of rest and celebration, yes, but also of transformation, and renewal. These are the ideas that inspired the design and staging of our brand-new production. Rooted in Jo’s power to create and transform herself and the world around her, we begin simply, with the image of Jo at her writing desk, a single lantern in the darkness, the artist imagining how to fill the empty page. As she writes, people pour onto the stage, their voices, and stories emerging from the shadows, growing brighter and more distinct as Jo’s storytelling gains force. And with this, there’s the potent juxtaposition of the warm heart of the March household, and the darker realities of the Civil War battlefront. that’s life, isn’t it? And always, that ineffable human ability to make something out of nothing, whether that’s weaving a story seemingly out of thin air, or how capable we are of finding the plenty in the scarcity; that way we have of finding something to share and celebrate, even when it seems we have very little. The Gallery Gift Shop at Chemainus Theatre Festival is one of the best shopping experiences around. This special place is known by visitors and locals as a wonderful spot to find quality artwork, gifts and more. Whether you are perusing during intermission, or shopping the wonderful boutiques of Chemainus, it is easy to find a special treasure. 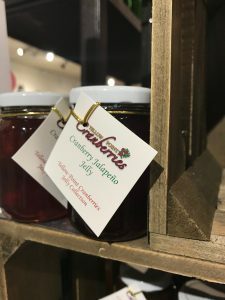 If you have not been in the gift shop lately, there is a new addition to the existing 100+ works of local BC artisans: the Gallery Farm Market. You will find an assortment of delectable goodies from local suppliers – a great way to support the theatre and Vancouver Island’s finest farms. In particular, Yellow Point Cranberries resides just north of Chemainus – beyond the delicious, classic cranberry sauce, there are jellies, mustard, and chutney. These make a great addition to any table the next time you are entertaining. 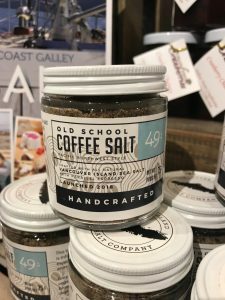 For the foodies in your life, there is ‘Old School Coffee Salt’ – this unique blend pairs espresso with local sea salt to add flavour anytime, whether as a rub for grilled meat or being sprinkled onto desserts or baking. There are other salt blends, olive oil, honey, salmon, and maple syrup. Stop by soon to see new additions and visit the rest of the gift shop to see the ever-changing assortment of items that have made the Gallery Gift Shop one of the best stops in Chemainus for shopping! “Grease is the word and it is now our all-time best selling production…This is the first time we’ve sold out an entire production run – remarkable considering it’s nearly three month’s long. 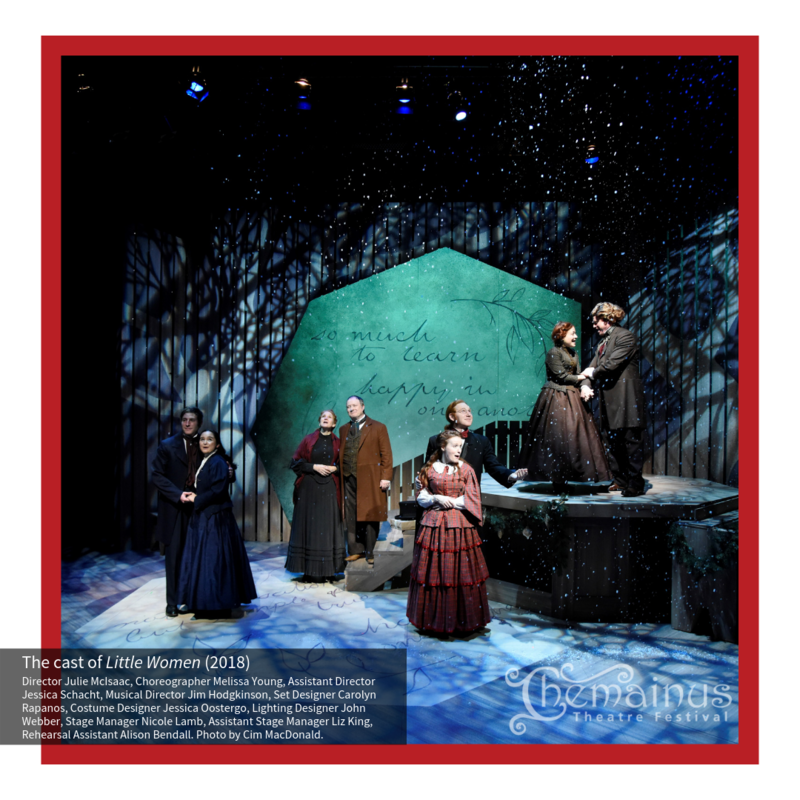 This likely places us in a small group of North American theatres that have experienced a complete sell-out over a continuous run of this length – 98 performances,” says Randal Huber, Chemainus Theatre’s Managing Director. Produced by the theatre 40 years after the hit 1978 movie starring John Travolta and Olivia Newton-John, the songs and story have not lost their appeal for audiences on Vancouver Island. 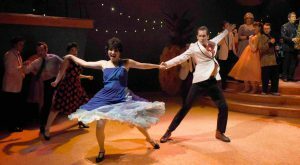 Summer visitors and locals to the Cowichan Valley have been flocking to the theatre and to enjoy favourite tunes such as ‘Summer Nights’ and ‘Greased Lightning’. Throughout its show run, even the town of Chemainus has worked to support this particular summer hit with events such as the downtown Classic Car Show, hosted by Tourism Chemainus. Earlier this summer, Chemainus Theatre announced that we have secured the rights to Mamma Mia, and the response has been outstanding. Audiences are using social media to tag friends and have begun to plan a visit to Chemainus next year to see this popular musical. The rest of the 2019 season will be announced this fall, followed by season ticket sales, and single tickets to go on sale in the New Year. Congratulations to the hard-working cast and creative team of Grease for putting on such a successful and fantastic show! Time and time again we have heard compliments about the set, costumes and how incredible every cast member was in their performance. The Chemainus Theatre, a not-for-profit theatre company, is happy to announce that the success of Grease has put us back on track for our 2018 season targets. We would like to thank everyone who has supported local theatre in the season so far, and look forward to seeing you for our future productions. If you’ve watched the hit ABC TV show Once Upon A Time, you will already be well familiar with the multi-talented leading lady of our upcoming Glorious. Beverley Elliott, also known as Granny in the modern fairy tale, is well known for her comedic hilarity as much as she is for her musical expertise and theatrical charisma. This is what makes her perfect to play our magnificently funny and charming Florence Foster Jenkins, the worst singer in the world who believed she was a virtuoso! 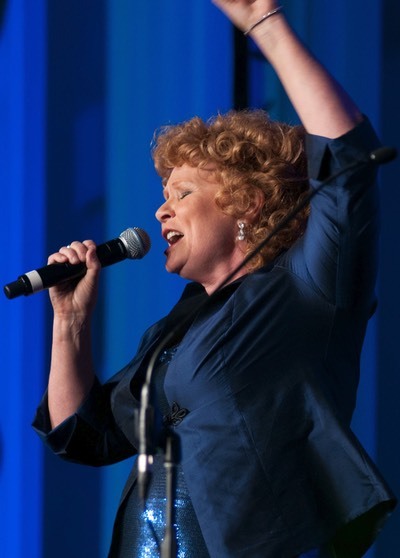 Beverly is a recording artist with music CD’s of her own, and performs her music at concert festivals. Her comedic bent is along the lines of comedy legend Carol Burnett and she has performed in a wide variety of roles on the stages of theatres across Canada. Her warmth and charisma, it can be said, is her trademark, and we are excited to see how that will inform her portrayal of Florence Foster Jenkins. 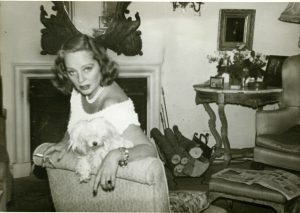 Florence, for her part, was the quirky amateur singer and flamboyant socialite known as the First Lady of the Sliding Scale, the squeaky soprano du jour, who sang her way into the hearts of New York society. She counted among her admirers composer Cole Porter, operatic tenor Enrico Caruso, and English conductor Sir Thomas Beecham. We look forward to seeing Beverley portray this “extraordinary woman who had the guts to follow her dream,” (Peter Brown, London Theatre Guide) and hope you will join us for the heartwarming hilarity sure to ensue! Book your tickets online now or call our box office at 1-800-565-7738. Chemainus Theatre is a constantly changing space. The stage changes, of course, to take us to different places and times through the magic of the sets, costumes, and stories. This year it has been a pub in Dublin, an historic recording studio, a convenience store in Toronto, and now a high school. The menu in the Playbill Dining Room evolves to reflect the current production and the seasonal foods sourced from farms on Vancouver Island. The walls throughout the theatre, gift shop, and lobbies are constantly changing as well. During every show, there is a new art exhibit creating a novel experience for patrons as they wander the lobby during intermission. Steve Coffey will be here for an artist meet and greet on Wednesday July 18th between 5 and 6 pm his work will be on display throughout the Chemainus Theatre until September 1st. For more information on his work please visit the Gallery Gift Shop website. 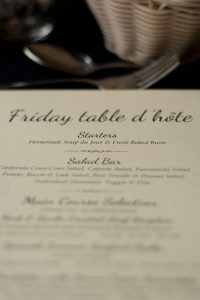 In 2018 Chemainus Theatre Festival executive chef Nick Caulford introduced a new dining experience to patrons of the Playbill Dining Room, Table d’Hotê. 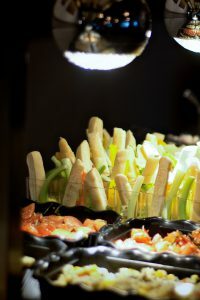 Still offering the traditional buffet experience with a salad bar and dessert buffet (including a chocolate fountain) the main course is a choice of four options for a plated dinner. The salad bar during our run of Grease features California Cous-Cous Salad, Caprese Salad, Panzanella Salad, Potato, Bacon & Leek Salad, Rice Noodle & Peanut Salad, Individual Hummus, Veggie & Pita as well as sliders with optional peanut butter (it’s tasty!). 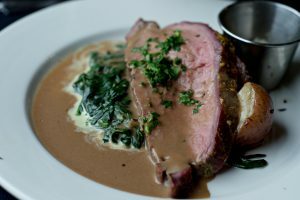 Main course is a choice between Paella (vegetarian or seafood), Roast Porchetta, and an Herb and Garlic encrusted Beef Striploin with Rosemary Potatoes and Creamed Spinach – which is what I chose. It was the perfect portion size and delicious! 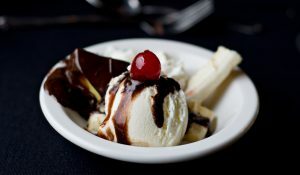 A buffet dessert is always a winner and for a very 50’s inspired experience you can make your own Banana Split! Whatever you are craving – apple pie, trifle, brownies – the team in the kitchen will make sure you are satisfied! Thank you so much to the serving staff of the Playbill Dining Room for their great service, ensuring theatre-goers feel relaxed and comfortable. It makes a night out at the theatre a complete experience! The full buffet experience is still available during the rest of the performances but the Friday Night Table d’Hotê is a great addition! The menus can always be found online for all the dining choices. Don’t forget, they change for every show. 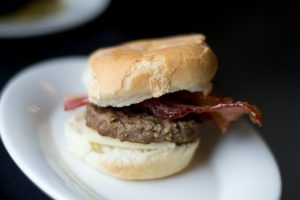 You will find something that will fit your schedule, taste buds and budget. See you soon!